No, not social networking- the original networking: real life, real people, meeting in person, type networking. Thanks to NYU, I have had the opportunity to go to events alongside various successful individuals, including some top level execs in the tech industry. I have attended these events in the hopes of making connections to someday (soon) land myself an awesome job. I’ve been learning through these experiences important etiquette for successful networking: dress well, introduce yourself with a firm handshake, remember names, and trade business cards. At every event I have been to so far, I’ve had to embarrassingly admit that I did not have a card to my name. For some extremely lucky reason, I was given a free ticket (retail price $999 USD) to attend the Social Commerce Summit happening in NYC. This event will include people such as Alex Maybank, CEO and Founder of Gilt Groupe, Jason Goldberg, the CEO and Founder of fab.com, and Tim O’Shaughnessy, CEO and Co-Founder of LivingSocial. (Holy awesomely cool, right??) These amazing people in the tech industry who will be there are going to attract other amazing people in the tech industry and they will all be surrounding me at this event next week. Too bad I don’t exist…. The people who know me know that, however often I make a fool of myself (unfortunately, too often), that I am quick to fix the cause of my idiocy. 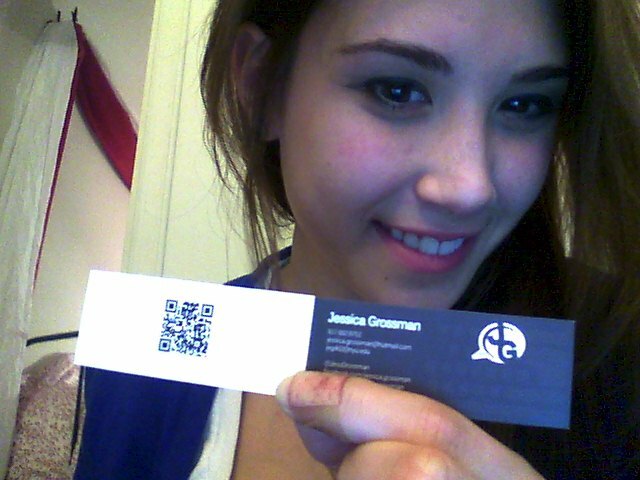 So, in order not to look like a complete tool at this amazing event, I decided to make myself some business cards. Originally, I was going to build myself a website in HTML5 that would be the hub of my life; social networking sites, portfolio, resume, contact, etc, and then I was going to make a corresponding business card. Realizing that I am actually in need of MUCH training to build a website for myself, and that it will take me quite a long time to do so, I decided to reverse the process. Instead, I designed my business card in a way that I will eventually design my entire website. Not ideal, but I had to do something. I realize the cards are small, but I had a credit for a free set of these. I figured, why not? They’re still pretty cute and unique. It’s hard to see them here with my terrible photography skills. Well, there you have it. I have a card to my name. I can attend this events, talk to people, shake hands, and trade identities. I hope you get those cards into the hands of people that will expand your life and help you to achieve your dreams! Sounds like you are on the right path! Do your thing!